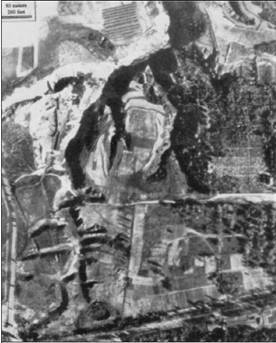 M. Wolski, “Le massacre de Babi Yar,” Revue d’Histoire Revisionniste 6 (1992) pp. 47-58 (www.vho.org/F/j/RHR/6/Wolski47-58.html). Cf. 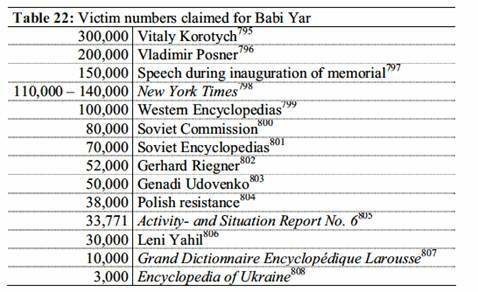 for this Herbert Tiedemann, “Babi Yar: Critical Questions and Comments,” in G. Rudolf (ed. ), op. cit. (note 44), pp. 501-528. J.C. Ball, op. cit. (note 457), p. 107, Ref. no. GX 3938 SG, exp. 104f. J. Hoffmann, op. cit. (note 24), pp. 215f. H. Krausnick, H.-H. Wilhelm, Die Truppe des Weltanschauungskrieges. Die Einsatzgruppen der icherheitspolizei und des SD 1938-1942, Deutsche Verlags-Anstalt, Stuttgart 1981, p. 333. Franz W. Seidler, Die Wehrmacht im Partisanenkrieg, Pour le Merite, Selent 1998, pp. 24-37. Bernd Bonwetsch, “Sowjetische Partisanen 1941-1944,” in: Gerhard Schulz (ed. ), Partisanen und Volkskrieg, Vandenhoeck & Ruprecht, Gottingen 1985, pp. 99, 101. Solomon M. Schwarz, Jews in the Soviet Union, Syracuse Univ. Press., Syracuse 1951, p. 220. H. Krausnick, H.H. Wilhelm, op. cit. (note 811), p. 621. Soviet Jews to have fallen victim to “the Holocaust,” ibid., p. 1218. Karl Siegert, Repressalie, Requisition und hoherer Befehl, Gottingen 1953; Engl. :”Reprisals and Orders From Higher Up,” in: G. Rudolf (ed. ), op. cit. (note 44), pp. 529-555. Franz W. Seidler, op. cit. (note 813), pp. 160-164. Cf. I. Gutman (ed. ), op. cit. (note 112), vol. 1, pp. 11-14. Lietuvos Rytas (Lithuania), Aug. 21, 1996, as well as personal communication by Dr. Mirsolaw Dragan. H. Hohne, op. cit. (note 760), p. 330. Efraim Zuroff, Occupation Nazi-Hunter. The Continuing Search for the Perpetrators of the Holocaust, KTAV, Hoboken, NJ, 1994, p. 27; cf. I. Schirmer-Vowinckel, “Inverser Verfolgungswahn: Von Beruf Nazijager,” VffG 2(1) (1998), pp. 63-68. G. Reitlinger, Die SS Tragodie einer deutschen Epoche, Desch, Munich 1957, p. 186; Engl. : The SS, Alibi of a Nation, 1922-1945, Heinemann, London 1956, p. 185. H.-H. Wilhelm, paper presented at an international historical conference at the University of Riga, Sept 20-22, 1988, p. 11. On the basis of this paper, Wilhelm compiled the article “Offene Fragen der Holocaust-Forschung” in U. Backes et al. (ed. ), op. cit. (note 167), p. 403-425, which does not contain this passage, however. I owe this information to Dr. Costas Zaverdinos, who owns a copy of the paper presented by Wilhelm in Riga and who reported about it during his opening speech at a historical conference at the University of Natal, Pietermaritzburg, on April 24, 1995. H.-H. Wilhelm, in H. Krausnick, H.-H. Wilhelm, op. cit. (note 811), p. 515. Reginald T. Paget, Manstein. His Campaigns and his Trial, Collins, London 1951, p. 170f.